2013 Cobb, Pinot Noir, Rice-Spivak Vineyard, Sonoma Coast. 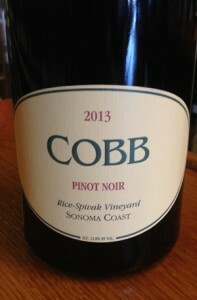 The 2013 Cobb’s are sublime Pinot offerings, especially great is the Rice-Spivak, one of my all time favorite single vineyard wines, this vintage brings these Cobb wines plush textures, pure fruit and divine balance and poise. The last few vintages seemed edgy, serve and in some cases lack a certain charm, but 2013 brought back the X factor, or sexiness, it still is heavenly low in alcohol at 12.8% which will appeal to the faithful, and there is verve and vigor a plenty to go along with beautiful silky fruit and a gorgeous inner perfume of wilted roses and crushed violets. The 2013 Rice-Spivak opens to immediate pleasure with floral grace, mineral tones, bright cherry, tart blueberry and raspberry fruit and a light dusting of spices, cedar, earth and a hint of candied citrus and cola bean, it feels dense and deep with round layers with rich detail and wonderful length, finishing with plum, strawberry, cinnamon and a touch of smoke, coming back to the beam of black cherry on the aftertaste, and with time in the glass. Ross Cobb has again, in my opinion raised his game and the latest set of Cobb wines are a must have vintage, he also has a great lineup of wines he consults for that deserve attention at Hirsch Vineyards and even his talents help guide the Banshee single vineyard cuvees, be sure to check them all out, and drink this thrilling Cobb Rice-Spivak between 2016 and 2025.